"Our focus is your horse's well-being and good health. Our feeds are formulated using the latest scientific research to nutritionally support anti-inflammatory metabolism. In doing so, we utilise optimum quality ingredients, which are carefully sourced, minimally processed and without artificial additives. Our feeds are not formulated using the cheapest fillers and waste by-product ingredients such as wheat-feed and oat-feed or 'nutritionally improved' (chemically treated) straw. These would provide us with a bigger profit margin, but that's not what we at Thunderbrook Equestrian are about......."
I don't know about you guys, but I read this and I really bought in, browsing through their products the Gut Cleanse caught my eye and I kept coming back to it, whether that be via the website, Google or searching the Horse and Hound Forum for further information. Thunderbrook describe their Gut Cleanse as a gentle cleanser of the digestive system, to aid natural removal of sand, soil, food and other debris and toxins. 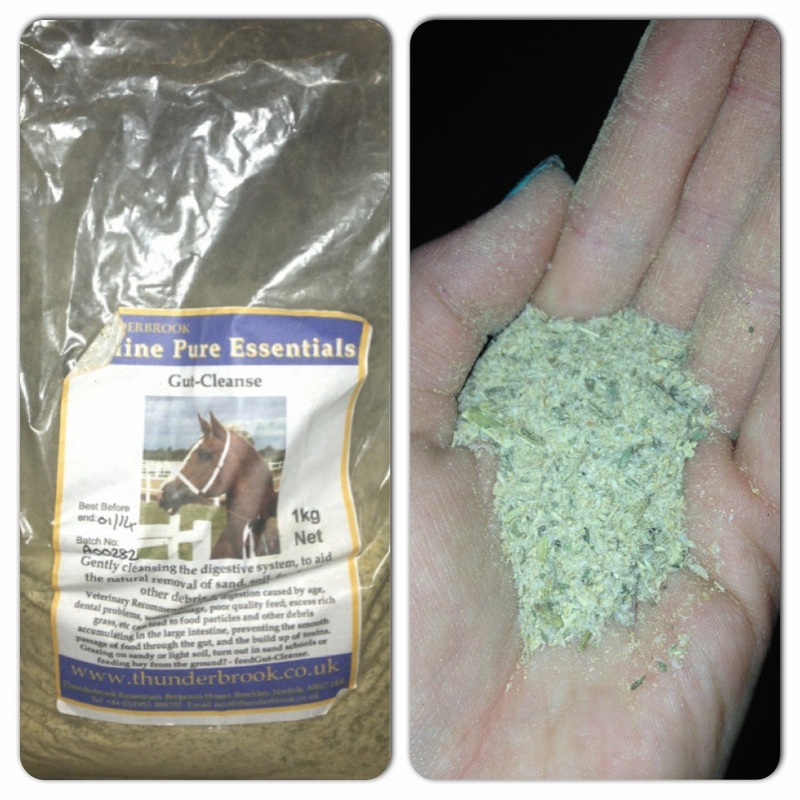 Ideal for horses with...poor digestion caused by age, dental problems, worm damage (this one was potentially us), poor quality feed, excess rich grass, sandy grazing, horses turned out in sandy schools. What's in it...the main ingredient is psyllium husk - this is an indigestible substance and a source of fibre, often used in humans to relieve constipation and irritable bowel syndrome. However, due to this being a highly water soluble fibre it swells, and becomes sticky like wallpaper paste (reported in humans to have caused choking - Thunderbrook do not issue this warning therefore please be aware of this if you choose to feed Gut Cleasnse). Thunderbrook add other vitamins, natural herbs and fresh bee products to the psyllium husk and together these act as a stimulant to the digestive system, to aid passage of foreign particles and toxins from the gut. The idea of Oscar having a 'detox' and passing all of the rubbish out of his system, after having worms and the possibility of sand laying in his gut as his favourite hangout during the Summer was his sand pit made the Gut Cleanse really attractive to me and at the start of Winter, so I took the plunge and purchased a 1 kg bag for £28.00 from their website. Feeding guidelines...feed 200g per day for a large horse, 100g per day for a small pony (under 13.2hh), split between meals, for 5 days consecutively. Optimum results are achieved when fed as part of warm mash, adding a handful of organic freshly milled bran, hot water (or fresh nettle tea by simmering a double handful of nettle leaves in a pan of water) and a small cup of linseed oil to regular feed. Sprinkle Gut Cleanse on and mix in just prior to feeding. The psyillum develops a gum-like consistency on contact with water and some fussy eaters may not like the texture. Be persistent, ensure the full 5 day course is ingested for best results. (Above wording taken from packaging). I followed the instructions, as above and added a little of his normal feed at the start of Winter 2013...(actually, small lie told there, I didn't boil nettles! I work full time!!!) and after days 1, 2 and 3 of him not touching his breakfast or dinner I rang for advise as I was concious he wasn't eating - the team at Thunderbrook were really helpful and offered that I introduce it gradually and went back to his normal feed, we played about for 3 weeks, feeding varied amounts of Gut Cleanse, occasionally Oscar would finish a meal, but only if I added a pinch of Gut Cleanse and NO more! I could kind of understand why, the feed would go cold and stick to the bottom of the bowl like glue! I almost felt bad asking him to eat it! It isn't all bad, the smell of the Gut Cleanse is pleasant, very herbal but I think for Oscar it was more about the texture of the feed than the smell that put him off. So sadly I never got to the stage of feeding the recommended amounts and therefore can't tell you if Oscar felt happier in his gut, but throughout winter I have continued to feed my pinch...not sure what I will do with the almost full bag now...! If any of you would like to try it, can always send you a sample. At the same time of purchasing Gut Cleanse, I also (foolishly maybe) purchased the Gut Restore too but haven't yet tried this after focusing all my energy on encouraging him to eat the Cleanser, I will review this product too once I am more familiar.